Let’s see, what did I like about this book? I’d say that, along with the mystery and the danger, I love the voice of it, the music of it. It’s set in the 50′, maybe that’s the reason it sounds like an old song, one you hear over and over again because it makes you remember when. In any case, I liked it, and I hope you will too. 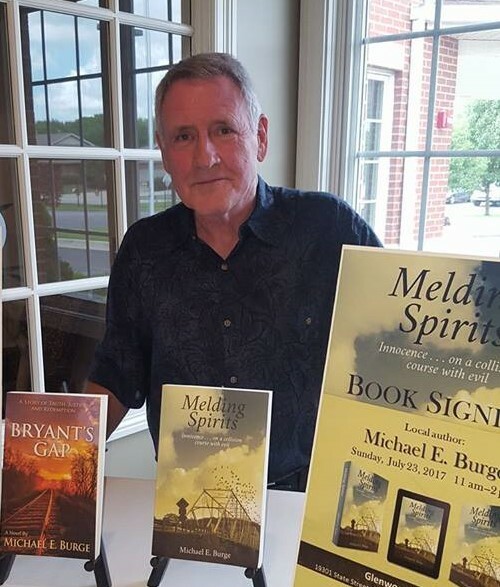 The book is Melding Spirits by Michael E. Burge, a Literary fiction, Mystery, Coming of age. To read reviews, please visit Micheal E. Burge’s page on iRead Book Tours. he came by and talked about one of my favorite things, music. Henry Wadsworth Longfellow once said, “Music is the universal language of mankind.” There is a lot of truth to this statement. Music can evoke extreme emotions and transport us back in time. In a split second, a simple melody can whisk us away to a tropical beach or cast us into deep despair. No wonder it’s so tightly integrated into movies and advertising; a song often stays with us forever, ready to trigger a memory. If you’ve seen the movie Butch Cassidy and the Sundance Kid, it’s likely you can’t hear Bacharach’s song, Raindrops Keep Falling On My Head, without your mind serving up an image of Paul Newman pedaling around on that bicycle with Katharine Ross perched on the handlebars. And what about the psychological thriller, Sea of Love, the movie starring Al Pacino and Ellen Barkin. I don’t know about you, but the 1959 song by the same name conjures up creepy memories for me. The song was the killer’s background theme; it played throughout the film when he committed his dastardly deeds. Music can be used in literary fiction in a similar fashion. We don’t have to hear the music through our ears, merely reading a song title can elicit a response. Stephen King often inserts lyrics at strategic places in his writing to set the mood of the scene; his novels, It and Christine are two prime examples. He stepped onto the porch and rang the doorbell. There was the sound of footsteps, then a woman appeared at the door. Her blonde hair was partially covered by a bandanna and she wore a flowered cotton blouse, magenta capri pants, and sandals. At that moment the only thing Evan could think of was the Carl Perkins song, the girl boppin’ down the street in her Pink Pedal Pushers, all the guys hootin’ and hollerin’ as she strolled by. If you’ve heard that 1958 song, Pink Pedal Pushers, performed by Perkins or Presley, you immediately comprehend the image in Evan’s mind. Not only do you have a vision but you hear the music in your head and begin to experience emotions bolstered by your recollection of the song. If you are a fledgling writer, keep one thing in mind. Quoting song lyrics without written permission can result in legal problems. Typically, an artist will charge a fee for the use of his or her words. It’s up to you to decide if it’s worth the cost to include them in your writing. Mentioning just the title of a song, however, is permitted, and it’s okay to quote lyrics if the song is in the public domain. Cool cover, new author for me. He was new for me, too! And I think the cover amplify the mood of the book, I liked it! Cheers on the tour, very nice vibe from this.